The trunk twist with weight plate press on the bench is a challenging core exercise. This exercise targets obliques and abs and is suitable for intermediate to advanced fitness levels. The v-sit double knee tuck is an intermediate core exercise that targets the upper and lower abs. This exercise is best suited for intermediate to advanced fitness levels. 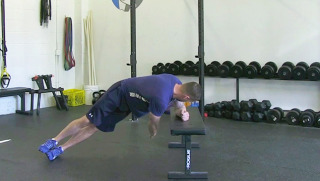 The bench plank dumbbell row is an intermediate upper body exercise. This is a challenging exercise that targets the mid back and core and is suitable for intermediate to advanced fitness levels. Stability ball pushouts are an advanced core exercise that really isolates and places alot of stress on the abdominals. This exercises requires a great deal of core strength and stability in order to be done properly. The double leg drop with the stability ball on the bench is an intermediate abdominal exercise. This exercise requires alot of abdominal strength as the stability ball increases the difficulty of the exercise. The leg drops on the bench are an intermediate core exercise that focus on the lower abs. This exercise requires a geat deal of core strength to maintain proper form and technique. The abdominal hip thrust is an intermediate abdominal exercise that that targets the abs and obliques.